First and foremost, even if you are not related through DNA or by the blood that is flowing in your veins, you are connected by the heart. Your step son is a miracle brought to this earth, he is a child that needs to be taken care of and if you have done that already throughout the years, then you must have learned to love him. Loving him simply means that you need not be reminded when he was born and you have been there for him when he needed you most, here are some quotes that will help you greet him on his day. Happy birthday step son, I will give you all the time that you need to be able to accept me. You gave what we have a chance and as your stepmom, I will forever be happy for that, kiddo. I think destiny must have brought us together, so I will believe and thank it every single day. Kid, you make me a proud step dad, you make me feel so easy, that this is a normal life. I would have never thought that having a child like you can make me feel so happy, here I am. Every challenge and myth we have debunked are just some of our bonding time, man to man. I can wait forever until you see me as the new wife of your father, happy birthday step son. My boy I am so happy for you and everything you have achieved in your life, keep doing that. We make a good team, you and I, we can stick together like this for a very long time, my boy. By getting along each other so well, we have proved them all wrong and I am thankful of it. We may fight and we may argue but that only means that we care enough to point out wrongs. I love you like any father would love her son, with a love that is never ending and lasting. Happy birthday step son, I’m going to be really patient in handling you and loving you. I am glad that I found your mom and even got a great bonus that comes with her: you, boy. Wishing you all the best for today, you can use my credit card to buy your ideal gift, my dear. Life has been a whole lot better with you right by my side and I am shaken up by that fact. 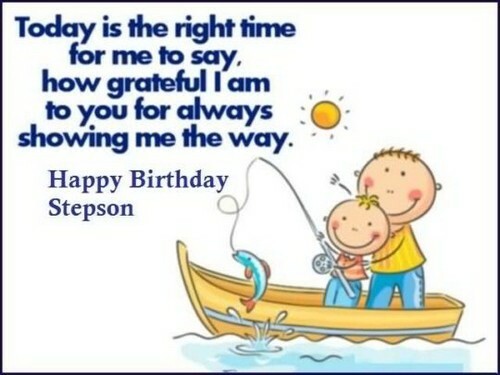 You are already a part of my heart and you will always be, have a happy birthday step son. Ever since we met, you have treated me as a real person, never like an enemy, I am thankful. Thank you for giving me some time so we can hangout, for giving me the chance to get close. You gave what was starting between us a chance, a bond between mother and a child, my son. My boy, what a wonderful man you have become, someone with good behavior and manners. What a wonder you are, great at sports and even at your studies, happy birthday step son. I have grown to love you with all that is within me, that is the honest truth, my dear baby boy. You put even real sons to a shame with the love and the affection that you have shown me, kid. I will not take all the credit to who you are today but I promise that I will try to be worth it. Raising a kid like you is like walking in a park because you make it easy, my dearest boy. You have grown up to be an amazing young man and I am so proud happy birthday step son. One of the best gifts that your mother has given me is such a wonderful kid such as you, dear. Honey, you are the cherry on top of the marriage that your mother and I had, thank you so. You were tied to me and together we share a mutual love and understanding with each other. I am so lucky to have a son like you that is both caring and lovable, I really do care for you. You surely got all of your father’s great qualities and that is why I was easily attached to you. Even my real sons cannot compare to you, I am happy you are mine, happy birthday step son. You make me believe that being a step mom is not that bad after all, you make me so happy. I will not go away from you no matter how you wish it to, I promise to stay through tough time. We may not look the same but you have my love all through your life, happy birthday step son. The relationship that we share, my dear kid, is far greater than any that I have in this world. You are part of my journey to a wonderful life and I cannot help but feel you are the first step. 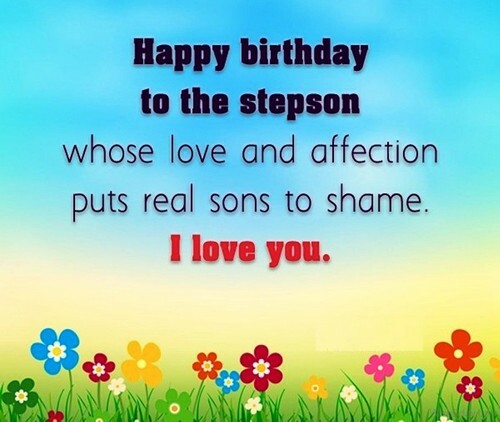 Happy birthday step son, I am giving you all my respect, my affection and love now and ever. We make a great team, you and I, and that is enough to keep me going throughout the day. 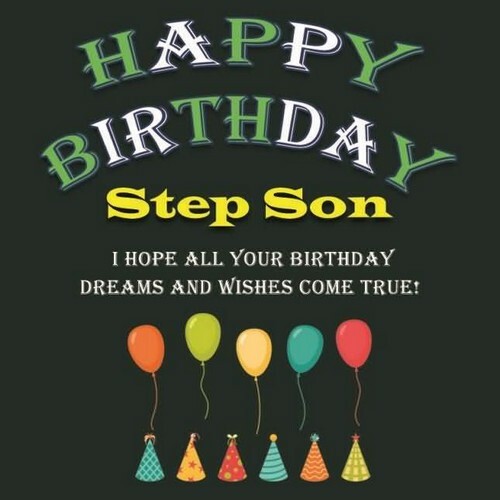 Though we may not share a lot of likes in the same things, I wish you happy birthday step son. Kid, you make me feel a whole lot younger, a whole lot happier and a whole lot more grateful. You welcomed me with so much warmth I thought that I was going to melt, thank you, kiddo. Never will I try to replace your father, I am here to help you along, happy birthday step son. You have been one of the best things that have ever happened in my life, I love you, my kid. I have no clue on how to be the best parent for you, but I promise that I will always try to be. Just remember that everything that I have is yours as well, for you are now my real kid, okay? People may say we do not look alike and that is true but they do not know love like I do to you. Happy birthday step son, I wish that I can be able to help you in moving on with your life dear. Every mother out there would be really blessed if they had a step kid like you, that is true. No one can ever say that you are only my stepchild because there is magic between us two. Do not let the world tell you how far you can go, only you can decide that, I am here for you. Happy birthday step son, I will love you the way I love my own kids, and prove that I care. You, my step kid, is enough for me, no need for real children, you bring enough joy to my life. May every day of your life be as wonderful as this day would be because today is your day! A blessing is what you have been to this family, your addition has brought us all great things. 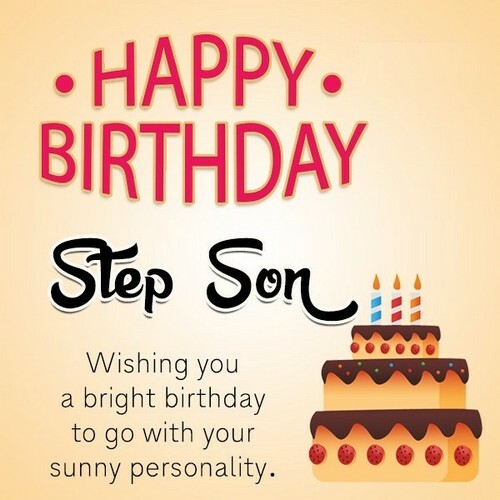 May we have a connection, you and I, even if it is just emotional, happy birthday step son. Today, on the day of your birth, I am wishing that all your dreams may come true, forever. 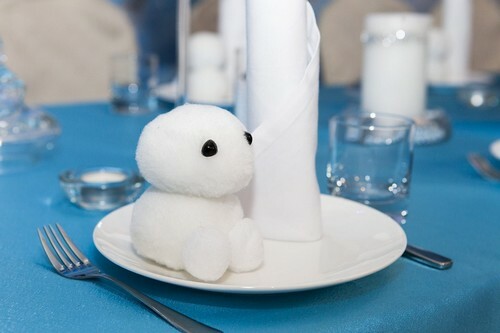 Surely, we had a lot of problems with each other, but it is also true that we love each other. We never let any of the things in life get between what we have and I am thankful for that, kid. You give me life and you bring colors and hues in it, thank you and happy birthday step son. Thank you for showing me that even a person like me can raise a good kid like you, my dear. 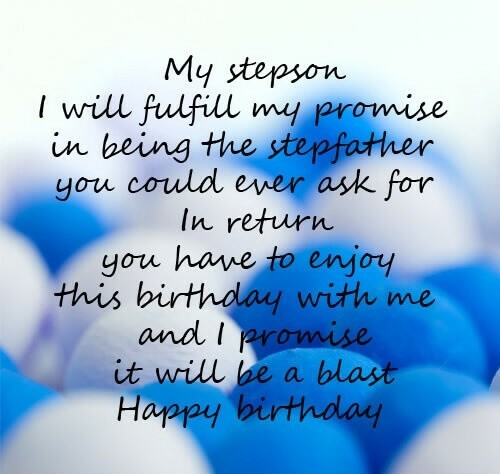 You are the step I am willing to take over and over again that you are happy birthday step son. Happiness is what you have brought me and what you will keep bringing me, my dear child. I may not have rocked your cradle but I will hug you until you are old happy birthday step son. Child there is no one else in the world I would rather spend my life raising than you I love you. For there is such a thing called acceptance in this world and you gave me just that, step kid. I will keep embracing you with my love until you finally accept me in your life, enjoy your day. Steering people in the right direction is what I am good at, brace up, happy birthday step son. The love of a step father for his son is thicker than most things too, happy birthday step son. Today is your special day and I hope that you get to make the most of it, my dearest step child. All that I am and all that I have, you are part of, for you coming into my life has changed me. It seems that life has not been good to you but when you came to me, I saw the heavens open. The Lord has the sense to bring you to me and I totally see that as a blessing and nothing else. You came into my life and make me feel what I have been missing, happy birthday step son. You opened up another part of me that I never thought was there so let me just thank you for it. Completed my life, that you did and I am still wondering why you only came now, my dearest. You are very important to me and your father is a living testament of that, for I love you, kid. How can a person as small as you hold so much love in your heart, I admire you for that, kid. 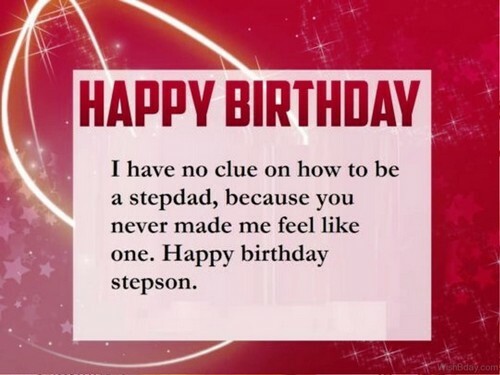 Thank you for treating me like a friend, I will make you feel loved, happy birthday step son. You are the best person in the world for me and I hope you get a blast out of your bday. You never showed any sign of hatred and I thank you for that, happy birthday step son.